Booksellers Retailers | Nationwide Book Distributors, New Zealand. Want to see our web-based listing of New Titles? Want to see a sales rep or receive New Title Information? Give us call on 0800 990 123 and we will arrange to keep you informed of new titles in a manner and time that best suits you. Got a great idea that will sell more books? In-store promotions, window displays, events, specialist markets, and special deals. Call us on 0800 990 123 to see how we can work in together on promotions to suit your store. We supply direct to schools and libraries. For discounts, trading terms and to open a trade account, please contact us. If you already have a trade account with us you can order online and receive your usual trade discount and terms. If you don't have a trade account with us, please contact us here. Trade orders are delivered freight free within New Zealand if the net (after discount) value is over $50 excl. G.S.T. For orders under this value a $3 fee will apply. We process and dispatch orders with a targeted 24 hour turnaround. Customers should receive orders within 2 – 4 working days.There is no minimum order value requirement. Most titles are sold on a Firm Sale basis unless negotiated with our sales reps for a specific promotion or display. Fiction is usually returnable as are most accommodation and travel annuals. Payment for supplied goods and services is due by 20th of the month following date of invoice. Our Office hours are Mon – Fri 8:30 – 5:00. Phone messages left after hours will be attended to as soon as we return. Simply browse our current months selling list, previous months or backlist titles and "Add to Cart" your required quantities. At the checkout stage select "On Account" and "Place Order". No login or password is required, simply fill in your store name and order number. Your order will be processed using your normal trade account, discount and terms as if you had faxed or emailed the order to us. Orders are usually processed within 24 hours and delivered freight free within New Zealand if the nett (after discount) value is over $50 excl. G.S.T. For orders under this value a $3 plus GST freight fee will apply. Please contact us for a Returns Authorisation Number before any returns are made. 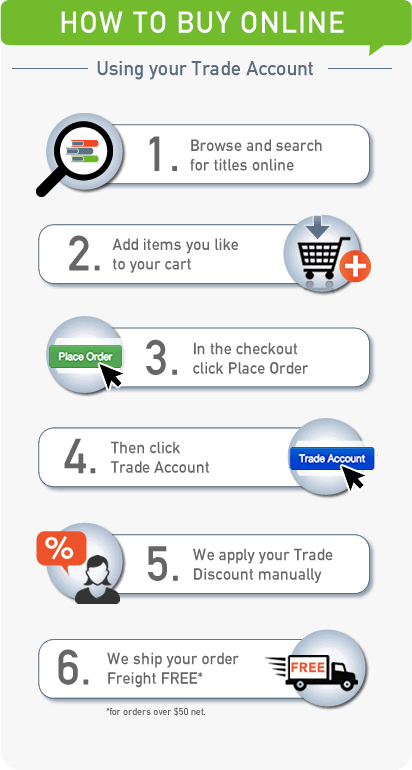 If you already have a trade account with us you can order online and receive you usual trade discount and terms. If you don't have a trade account with us, please contact us here.